Towards the end of last year, I was approached by Cake (Havas PR) on behalf of Sony Mobile and asked if I would like to participate in the Sony Mobile Xperia Campaign. They wanted me to shoot a series of images using the latest Xperia Mobile device to show off their innovative mobile camera technology called Motion-Eye. They would then use these images for social media, in-store and on devices worldwide. First, I had to compile a list of shots to present to Sony so they could approve my concepts. Trying to come up with 20 plus ideas for action images might seem like it should be simple as frying an egg but it was in fact quite a challenge. I had to weigh up not only model availability and time travelling to and from shoots, but think about gaining permissions including the likelihood of getting photographic releases for property and people. I also had to remember that these shots were going to be used Worldwide so I thought it a good idea to keep the images accessible and relatively identity free in terms of location. After a good brain storming session and having had the list approved by Sony this left me free to start scouting models and locations for the shoots I was planning. RUNNING TO CATCH THE POST! A few days later a package arrived in the post. It was a shiny Sony Premium Mobile! Whoop! Not being familiar with how it operated, I immediately went out to test run the device and discover how all the features worked. The first shot had to be one of my dog of course and I ended up capturing a great shot of her which Sony first used on Chile Instagram. Daisy’s first venture into modelling! 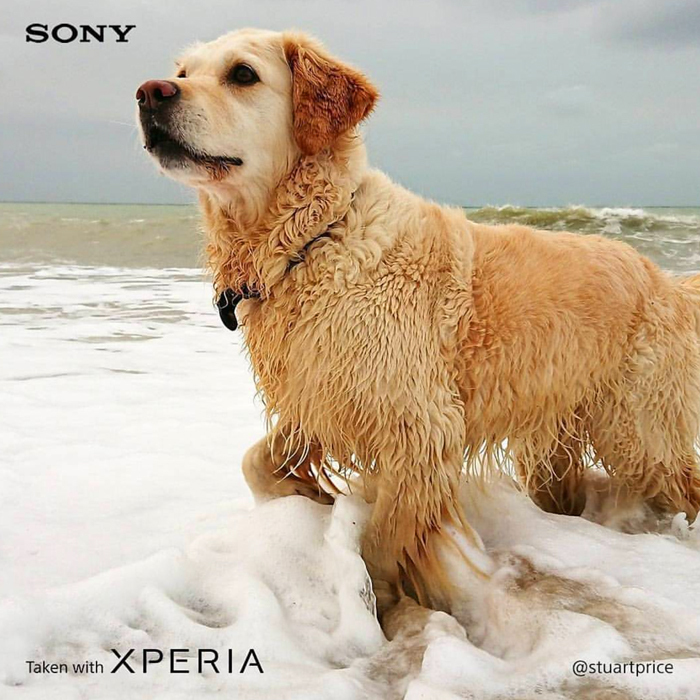 Daisy's first foray into professional modelling now gracing the pages Sony Xperia Chile! As it was Autumn, one of the shots I had in mind was falling leaves as this would be colourful, show motion and provide some impact especially against a blue sky. Spending half a day walking around my local woodland, I used a mobile phone holder on a tripod and a bluetooth photo release trigger. This was just to make my life easier leaving me hands free to throw leaves in the air trying to capture them as they came down. After a few days of fantastic sunny weather, a huge depression descended on the UK and I had almost 2 weeks of wind and rain to contend with which put a hold on some of my plans for shots. The sun did manage to break through a few times so it was essential I was on my toes to run out and grab shots. JUMPING FOR JOY NOT KNOWING ICE-CREAM WAS ON IT'S WAY! On one of the infrequent blue sky days, I went to my local park and shot a couple of kids, who were kindly borrowed from a friend of a friend who also happened to be a photographer. Having a parent as a photographer meant they were used to posing in front of a camera. In fact they had already modelled for quite a few big campaigns in London so this made the shoot a whole lot easier. Their reward - Ice-creams! One of the shots I had in mind was of a model running through trees carrying a bunch of balloons that would be floating in the air behind her. I arranged a shoot with a local model at 3pm who I would meet on location. Huge round of applause - Storm Brian was on its way bringing high winds with red and amber flood warnings! That’s all I need; this project felt cursed with amount of water that was falling from the sky! Deciding to stay positive I had to quickly come up with ideas for shooting in the rain. It’s not so bad that the weather was dreadful, as it can be a blessing. I was forced to go out and shoot in the wind and rain; actually, ideal for capturing movement! This is probably one of the best ways to gain inspiration, just going out and walking. I came across an idea to shoot through wet window panes focusing on the rain falling down the pane with a person or people walking passed dressed in bright colours perhaps holding an umbrella struggling to open it in the wind, as per photo. The next day wasn't any better so off I went with a model both of us getting soaked to the skin. At least the images turned out well! Next on my list was a morning shoot of a care free Labrador called Freddie belonging to a lovely Lady who draws cartoons for the New Statesman and the Oldie. (check her out here). Freddie showing no concern for the ominous clouds in the distance! We arranged to meet down on the seafront in Brighton as I know Freddie loves jumping around in the sea. What I didn’t expect was, I quite enjoyed it too! At least I didn’t have a choice when a huge wave came crashing down on top of me. Could I get any wetter this week? Spending around 30 minutes, I jumped in and out of the waves as Freddie (sort of) chased everything thrown into the sea for her to fetch. I came out (dripping) with some great images and the Sony performed brilliantly. I was very impressed with how well it responded so accurately and I loved the predictive capture feature. A bit of the South Coast in my trainers after shooting Freddie..
Then it was straight off to Surrey where I had an appointment with a Morgan Plus 8 via home and a hairdryer. The owner lived near a great ford crossing in the woods which was just ideal for the car to go splashing through creating huge waves either side of the car. It didn’t take long to get the shot. I probably ended up shooting around 40 images, of which 17 were selected for publication. b) Use the resources that are available to you and don’t be afraid to change direction. Embrace the problems and new openings will come your way. All shots taken with the Sony Xperia Premium using only in device editing features.